You’ll hear everyone talk about Senior Spring like its a legend – as it should be! We started from the bottom, now we’re here — maybe Drake is so catchy because everyone can relate. But why wait for the spring to start the legend when the class of 2014 can start now? I’ve been constantly denying my imminent entrance into “the real world” (where I’ll have to pay things like rent and electricity … and cook for myself … maybe) while simultaneously reminding everyone of my senior status to demand the profound respect I should automatically deserve. Long story short, I’ve been beyond enjoying my first two weeks of school. I can attribute much of my happiness to the freedom of my class selection. I’m concentrating in Neurobiology (concentration is Harvard’s fancy word for major) and pursuing a secondary field (Harvard’s fancy term for minor) in Global Health and Health Policy; I still have a few course requirements left as well as some classes that I have to/want to take in preparation for medical school. A lot of the classes overlap so that they double/triple count for things so it’s been really manageable — and dare I say FUN! Now that Shopping Week is over and Study Cards have been submitted, I know what’s ahead of me (at least academically) this semester! *Shopping Week:The first week of every semester where students are free to drop in or leave any classes. Students can use this week to their advantage by getting a feeling for the professor and the course material. You can get a sense for a class from a syllabus, but attending a class – even if it’s just for a few minutes – will give you more familiarity with what you’re committing to for a whole semester! *Study Card: A physical piece of paper with a list of classes students want to enroll in – there is a deadline date and time that this must be submitted. There’s a fee if it’s turned in late, but there are plenty of email reminders so this should never happen! Also, depending on what classes you’re taking, professors may need to sign the Study Card in order for students to enroll. The add/drop date is after the Study Card deadline so classes still aren’t exactly set in stone for a few weeks! The list below are the classes I’ll be enrolling in for the rest of the semester. I’ll start off with the official university description in italics and insert my personal commentary as well. I’m really excited about my classes this semester because I’m taking 2 more independent classes. The good side is that I have a lot less hours of structured class which makes my job search for next year a bit easier, but the flip side is that I’ll have to constantly remind myself that there is a ton of work for those independent classes! It’s my first time taking independent classes – take this as a plea to keep your fingers crossed for me! 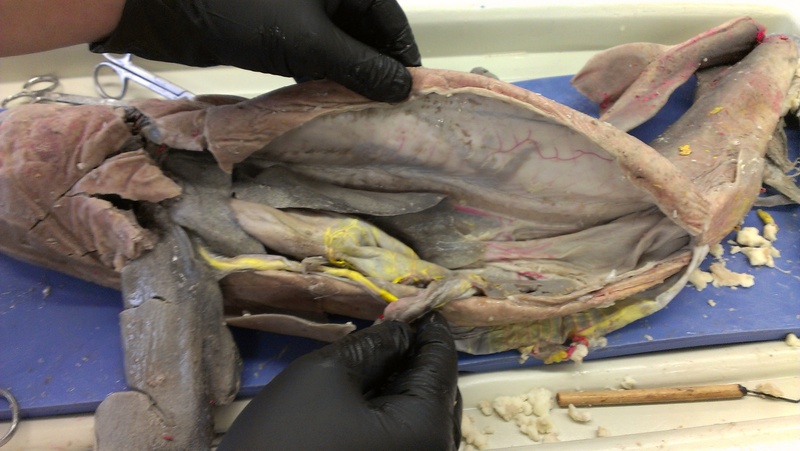 A laboratory course that immerses students in a dynamic project-based research environment. Participate in experimental projects directly linked with ongoing faculty research. Students select a project from the following research tracks: neurobiology, microbial sciences, cell biology, and synthetic biology. New projects, including some in other research fields, are offered every term. In a highly collaborative atmosphere, students form a fully-functional and diverse research group based on the sharing of ideas and progress reports between projects. New projects every term. Students collaborate to form a fully-functional and diverse research group based on the sharing of ideas and progress reports between projects. The spring microbiology project is part of the “genomes to Biomes” series. This is class one of two of my independent classes. This class physically meets every Thursday afternoon where students from every project must attend and there will be presentations on the progress of their project. It’s a wet lab class that I’m completely stoaked for because I really haven’t done too much wet lab (read: pipetting and the like) outside of the labs associated with classes. I did a lot of wet lab research outside of classes for summer internships during my high school summers, but have been preoccupied with taking advantage of Harvard’s abroad resources during my college summers. I generally just love research. I’ve never been in a better environment. All researchers are the epitome of chill. For example, they aggressively insist on being called their first names! The down side can be that the timescale just feels like the slowest thing ever because some experiments (i.e. dealing with cell cultures) can be very time consuming, but the bright side is that you get to set your own hours! Students will have access to the lab 24/7 too! I think the chill setting of research is fostered by the researchers’ strong curiosity in their work – we’re internally motivated to completing our experiments in order to answer our own questions. Being immersed in such an academically driven environment will only do me good. We’ve only met twice and the lab part hasn’t actually started yet, but I almost cannot contain my excitement. Seriously. The professor of the class, Alain Viel, is amazing and he has been the topic of my conversations with both my social peers and academic superiors. My favorite joke Alain has told so far happened when he was explaining the logisitics of the lab and said that there are two types of lab jackets: disposable and non-disposable. “A non-disposable jacket is a disposable one with your name written on it.” He also brought us presents for being students! 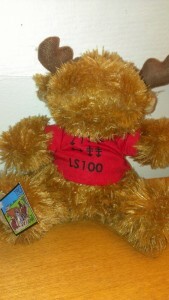 Moose teddy bear presents for enrolling in LS100r! For the semester, I’ll be working under Cristopher Bragg‘s experiment on modeling hereditary dystonia in human neural progenitor cells. We’ve been talking about knocking in and out some genes and casually isolating RNA. Our first hands on lab has been scheduled for this coming Monday. The project has a team of 6 undergraduate students and we plan on meeting Monday night to prepare for our presentation on Thursday. Hopefully we’re setting both the tone and the pace for the rest of the semester! Why is the human body the way that it is? This course explores human anatomy and physiology from an integrated framework, combining functional, comparative, and evolutionary perspectives on how organisms work. Major topics, which follow a life-course framework, include embryogenesis, metabolism and energetics, growth and development, movement and locomotion, food and digestion, stress and disease, and reproduction. Also considered is the relevance of human biology to contemporary issues in human health and biology. I think this class has a reputation on campus for being the class most likely to mirror medical school. It’s a class heavy on its memorization so I’ve been intimidated for a few years. In addition to the three hours of lecture every week (pretty standard for a class), there is also 3 hours of lab. 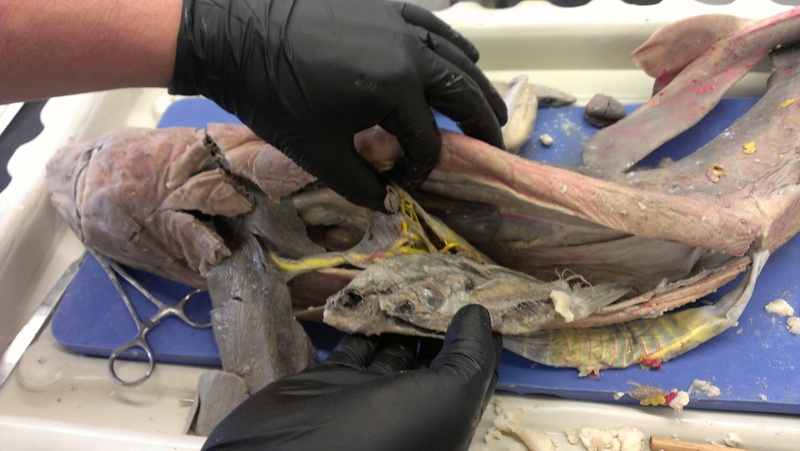 I had my first lab this past week and I couldn’t stop talking about it because we dissected a dogfish and a lamprey and I simply love cutting everything up. It was more of an exploratory surgery lab and there was residual adrenaline in my system for two subsequent days. 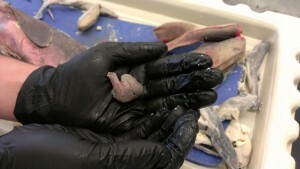 I found FOUR babies in my dogshark! Each with its own yolk sac! 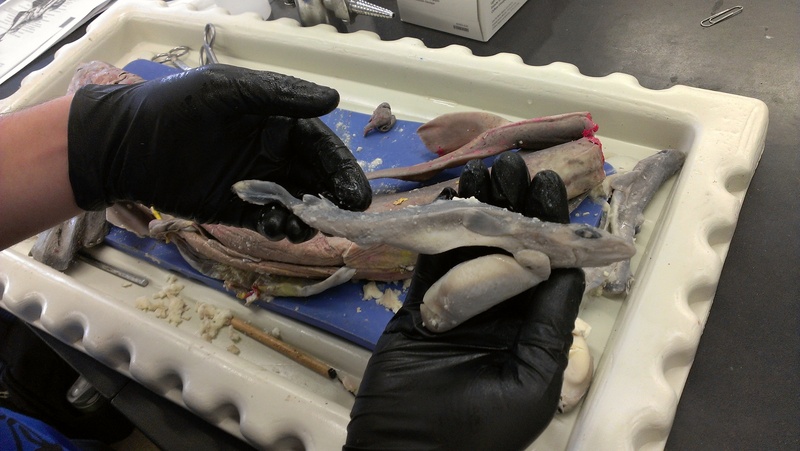 Everything I cut seemed to lead to more babies, but I eventually found its stomach…and its final supper! The heart – I still can’t wrap my mind around how small this heart is! One of the professors of the class, Daniel Lieberman, is super cool. If you’ve read any of his books, it’s obvious that he loves to run and a handful of my undergraduate friends work in his lab to study running forms. Outside of lecture, I tend to see him every Sunday morning as well during our warm up for Harvard On the Move, which is a group open to the entire community that encourages people to exercise whether if it’s walking, running, or even doing stadiums! Health and medical care pervade every aspect of our lives. This course uses quantitative methods (graphical analysis, algebra, data analysis) to examine issues related to health, disease, and systems for delivering health care. Topics to be covered include differences in health between rich and poor countries, differences in types of medical care and who receives it, and the political context for reforming health care policy. Techniques for analysis will be developed and demonstrated in class and section. The course uses examples from a variety of international settings, but focuses mainly on health and health care in the US. I’ve never heard about this class and therefore, it wasn’t on my radar when I was planning or shopping. Word of mouth made it a popular class though as the number of students who enrolled actually doubled their expectations, which meant that they hired more staff for the class since its goal was about a 1:12 TF (Teaching Fellow – usually a grad student, along the lines of a TA/CA teaching assistant/course assistant at other universities) to student ratio. The professor of the class is David Cutler, who strikes an incredibly rare balance of being super knowledgeable as well as not being scary-intimidating. I plan on scheduling a meeting with him soon in hopes of him helping me with my mini-thesis (see next class below). I’m really excited about this class because it combines global health with statistics which I’ve never done before! I’m also hyper-interested in all the topics because it seems like I was exposed to many of our discussions when I was in Africa this past summer pursuing clinical research in maternal health and nutrition. Our last lecture revolved around HIV/AIDS, tuberculosis and malaria. I can for sure say that if I wasn’t involved in my summer internship, I would not have been as impacted nor interested in the last lecture. Supervised reading leading to a long term paper on a topic or topics not covered by regular courses of instruction. Call me a slacker or whatever, but I’m not writing a senior thesis for my neurobiology concentration. I had a few weeks when I was really into the idea (I wanted to see if there was a neurological mechanism to preference construction – essentially determining whether or not brain activity was involved with playing favorites!) and planned out a whole proposal and everything too. However, I would have had to commit my summer to thesis research in Boston and when the opportunity to pursue clinical research in Tanzania appeared, I couldn’t resist hopping on a plane! Although I won’t be writing a thesis for my neurobiology concentration, I’ve decided to write a mini thesis for my Global Health and Health Policy secondary field. I want to write about maternal health and nutrition within the context of malaria — essentially continuing my project from the summer. Since this is an independent course, it requires an adviser. I asked the principle investigator from my summer clinical trials to fulfill this role, but I was, unfortunately, rejected as he is more than busy! This has pretty much led me to scramble and in my frantic state, I’ve emailed tons of people (that I don’t personally know) in the hopes of them blindly agreeing to advising me or pointing me in the right direction. Maternal health in terms of malaria is a pretty specific expertise so I was having trouble in my quest for an adviser. As of now, I do not have an adviser. BUT things are looking up! (Fingers crossed!) Harvard is actually hosting this Defeating Malaria competition. I’ll explain more about the competition later (next post!) when I understand the details myself, but I’ve reached out to one of the organizers of the competition and she has been an angel about referring me and connecting me with the right people. After I secure an adviser (knock on wood), I’ll have a better sense of my topic for my research paper. By the end of the semester, I’ll have at least 20 pages written about maternal health and malaria — WOOT! The synapse functions as a fundamental signaling unit of the nervous system, and underlies all forms of brain activity. We will first explore the biology of glutamatergic synapses, focusing on receptor function and synaptic plasticity. Then we will address how synapses function in neuronal networks and direct behavior. The course will highlight important biological concepts as well as technical advances. A full time College student normally enrolls in four classes per semester. Yes, I’ve already listed four courses, but before you go judging me as this crazy hyper-motivated Harvard student committing academic suicide, this Neurobiology tutorial I’m about to describe is technically half a class! It counts as half a class per a semester and lasts throughout the entire year. Therefore, it will count as one full course by the time I graduate. Neurobiology tutorials are typically taken by juniors – I took one last year called Dopamine which has become enormously popular after my classmates and I endlessly raved about it. Tutorials are really small and intimate classes based on our discussion about the current scientific journals we read. I love it. Reading research articles has been one of my favorite homework assignments since MCB 145 Junior fall semester; I find it one of the most fulfilling activities that are challenging. There are some things that are just hard because they’re mean (organic chemistry) and some things that are hard, but still fun to decipher (reading science papers)! At the beginning of the school year, there’s always a neurobiology tutorial fair where all the teachers come with syllabi to talk to interested students. I talked to Geoff and Helen at the fair and they were too adorable for me to not take the class. They insisted on both being present at every class and just seem to genuinely care about undergraduate students. Plus, they provided cookies during class. That’s my academic roadmap for the semester! I’ll talk more about my extracurriculars in my next post because a Harvard student’s life would be incomplete if he/she only attended class…as corny as this sounds, that was Real Talk.